The Data Vault was invented by Dan Linstedt at the U.S. Department of Defense, and the standard has been successfully applied to data warehousing projects at organizations of different sizes, from small to large-size corporations. 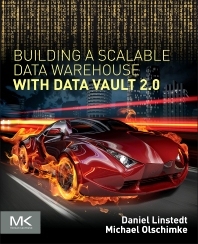 Due to its simplified design, which is adapted from nature, the Data Vault 2.0 standard helps prevent typical data warehousing failures. How to load each layer using SQL Server Integration Services (SSIS), including automation of the Data Vault loading processes. Important data warehouse technologies and practices. Data Quality Services (DQS) and Master Data Services (MDS) in the context of the Data Vault architecture. Michael has more than 15 years of experience in IT and has been working on business intelligence topics for the past eight years. He has consulted for a number of clients in the automotive industry, insurance industry and non-profits. In addition, he has consulted for government organizations in Germany on business intelligence topics. Michael is responsible for the Data Vault training program at Dörffler + Partner GmbH, a German consulting firm specialized in data warehousing and business intelligence. He is also a lecturer at the University of Applied Sciences and Arts in Hannover, Germany. In addition, he maintains DataVault.guru, a community site on Data Vault topics.